Earlier today Russia canceled a longstanding nuclear reduction agreement with the United States that would have eliminated enough Plutonium for 17,000 nuclear warheads. In response, the United States announced that talks were over with Russia in Syria. The ceasefire is over. Aleppo is soon to be crushed (possibly fulfilling part of Jeremiah 49) by a huge force of Russian, Iranian, Syrian, Afghani, and Hezbollah troops and it's anyone's guess what happens next. 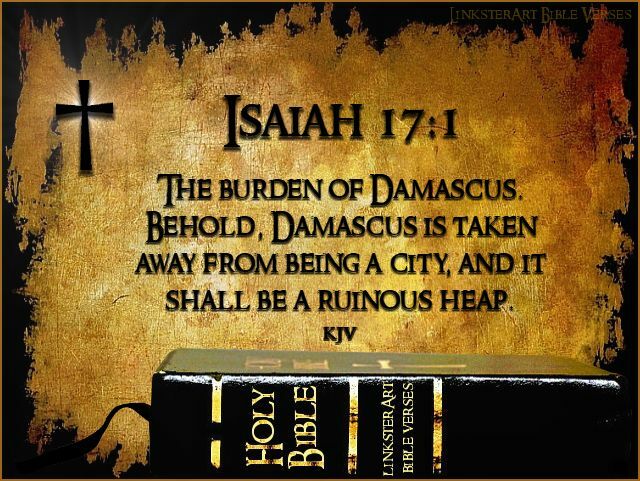 If the United States responds militarily, Damascus would be target number one. What would a Christian say after reading the Scriptures? What would a Christian say? A. Life begins at conception. B. At conception there is nothing but a nonhuman blob of tissue. A. Drinking wine with alcohol content of 12 to 14% is prohibited by God. B. Social drinking has been approved by God, because a few drinks cannot hurt you. God wants you to relax and have fun. A. Man-made CO2 emissions change the weather and climate. Men cause rain, snow, droughts, tornadoes, freezing weather, global warming, global cooling and earthquakes. B. God created climate and weather, and only He can change it. A. God created the heavens and the earth in a few billion years, because it was impossible for Him to do it in six 24 hour days. B. God created the heavens and the earth in six 24 hour days. A. You cannot be severed from Christ, because you were never saved in the first place, that is what God was saying. B. Even if a Christian lives a sinful unrepentant life and reject Jesus as the Christ he cannot fall from grace. C. Christians can fall from grace and spend eternity in hell. Should Christians say the same things that God says or repeat what others have convinced them is true?